The jury is still out on whether Marissa Mayer will be able to save Yahoo. But has her announcement to take limited time off for delivery raised the bar for working mothers? So Marissa Mayer, CEO of Yahoo announced (yet again) that she was taking limited time off for the birth of her twin girls in December. “Limited time” here refers to two weeks. Yes, you heard right. I have been hearing a lot of “how dare she?” and “what does this mean for mothers?” and “how can she set a precedent?” and other such outcries on social media and it amuses me that three years ago, I had reacted similarly to her first micro maternity leave announcement. Soon after that, she issued an internal memo to her employees on introducing a ban on working from home. Needless to say, the memo sparked a debate on whether remote working leads to greater productivity and job satisfaction or kills creativity and is just a chance to slack off. Is this the same woman? Doesn’t this sound dichotomous? But then, motherhood is the biggest dichotomy anyway and there are ways and ways of negotiating it and there is no right or wrong about any of them really. There are those like my mother who get on with it, leaving the baby with family and formula (those were the glorious joint family days). She was a school teacher, so her hours were good. She loved her job and retired from the same school 34 years later. There are others who do daycare, nannies, grandparents, or a combination thereof, depending on what their sanity or salary can afford. There are those, who like me, decide that jobs can be got back, but baby time can’t, and plunge into full-time baby care. If you do the former, you are often looked at sceptically as someone who chose career over motherhood, money over emotional bonding, bottle over breast. If you choose the latter, you are looked upon as someone who was using motherhood as an excuse to sit at home and ‘do nothing’, who is an emotional sucker waiting to be manipulated by her child, who wanted out of the rat race and has found her way. Not that quitting work is an option for most women–you need a partner who is willing to put the bread on the table, sometimes jam and cheese too, for an indefinite period of time, while you play primary caregiver to the baby. So damned if you do and damned if you don’t. Your reasons for going back could be as compelling as your reasons for staying at home. Money, of course is the biggest reason, considering that two incomes are better than one, now that there is an additional member in the family. It’s evident that Mayer won’t be breastfeeding her twins (most of the times, twins are not breastfed anyway as there is never enough milk). It’s silly to even ask if she has support because she can afford the entire daycare industry. And why is no one questioning her husband’s paternity leave? Isn’t that equally important in a power couple scenario? Why is he not being judged for that? It strikes me as odd that we are discussing Marissa Mayer only when it comes to her maternity, and never for the work she does (which must be a lot, as Yahoo! CEO). And that, I think is a greater crime against feminism than what signs she is sending out, coming to work two weeks after popping twins. 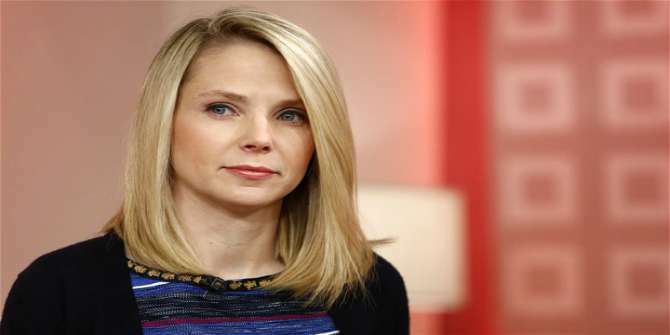 If she joined Yahoo as CEO when she was 28 weeks pregnant, her game is clearly different from millions of other mommies. So why judge her for playing what is clearly not every woman’s game? I would judge her if she applied the same rules to her employees, but she hasn’t done that yet, has she? Of course, it undermines the campaign to improve statutory maternity leave in the US. Of course, the US has a dismal maternity leave policy and surely the law in the country should be strengthened to guarantee paid parental leave. But the jury on when is it okay for mothers to return to work post-childbirth is still out there. The point is, none of you who read this article is Marissa Mayer, and so your motivations will never be same as hers; you are not playing the same game that she is. Marissa signed up to be the CEO of Yahoo, not a maternity leave role model; she is only doing what it takes to keep her equity as a CEO intact. To that end, her FaceTime is really important to the investors at Yahoo and much rides on it. But Marissa Mayer is not asking you to give up your maternity leave for your career. If that’s what you are reading as a subtext of her decision, that is clearly your problem, not hers. If you have any insights, questions or comments regarding this story, please share them in our Comment box below. Kangana Ranaut's sister Rangoli is pregnant and THIS is what she decided to do first! Kajol's son Yug Devgan is all grown up and looks a lot like his gorgeous mum!